On the Aurora, we also traveled to the western edge of mid-bank to where all the morning’s activity was, and weren’t disappointed! 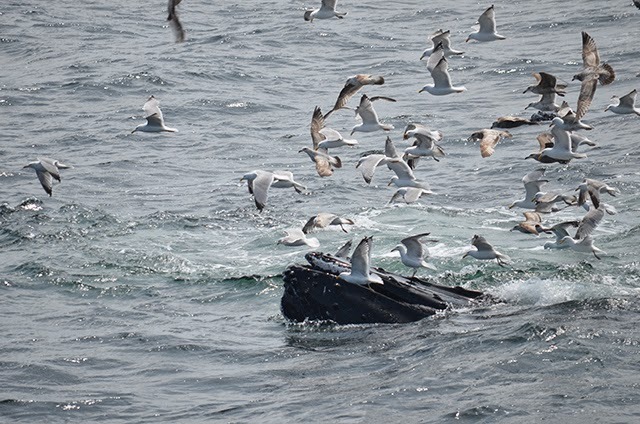 We had a total of 10 to 15 humpbacks, a few grey seals, a minke, and TONS of gull and Northern gannet activity. 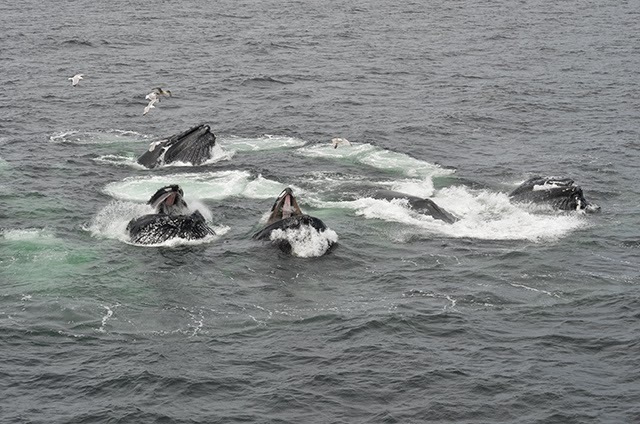 Six hungry humpbacks emerged from the center of the bubble net with pleats full of fish. 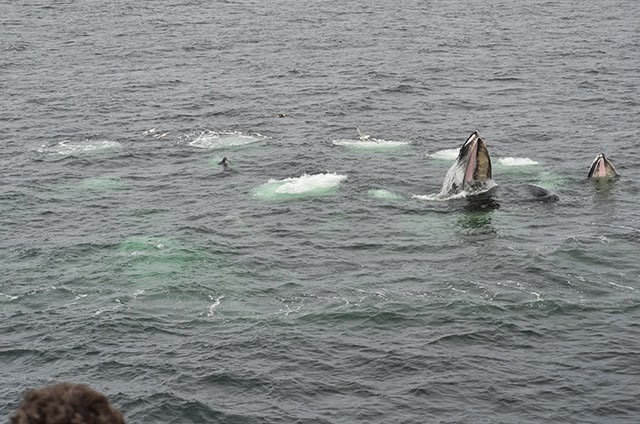 Our whale watch started out with a bang by getting looks at one of the biggest bubble spiral nets I have ever seen. 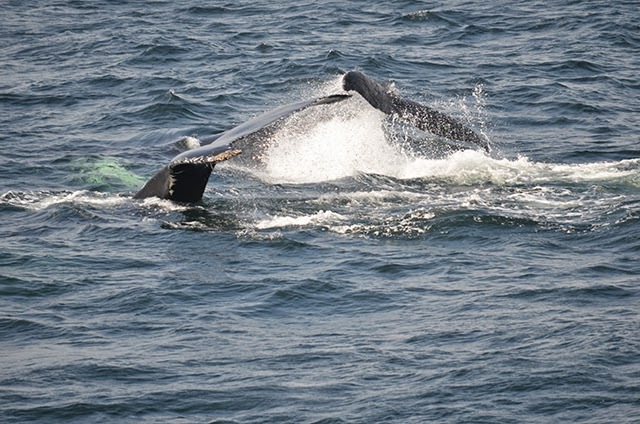 We got a great treat of six humpbacks emerging open-mouth in the huge net—the photos don’t do it justice! This group stayed together the majority of the trip, but it was hard to keep track of the constant association changes. 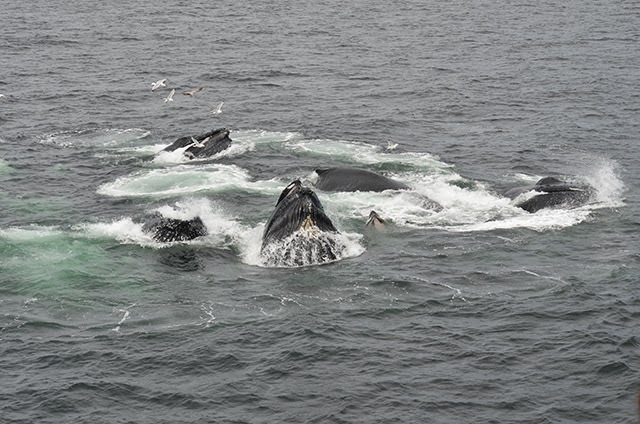 At any given time we observed 2-3 spiral bubble nets at a time at the surface, along with a few kick-feeders and other subsurface feeding whales. It was certainly easy to spot the bubble clouds with all the gulls swarming around. The other pair that stole the show was Glo-Stick and her calf. Glo-Stick continued her kick-feeding/bubble net feeding she has been displaying the last week – but it almost seemed as if the calf was mimicking his mom. A few times after Glo-Stick would kick – so would her calf! 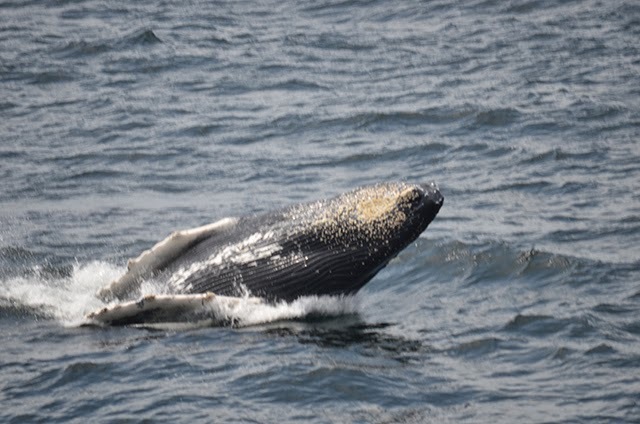 We can’t always assume what the calf’s behavior means – but we have learned that humpback kick-feeding on Stellwagen Bank appears to be a learned behavior, that is passed down almost like a “culture”. 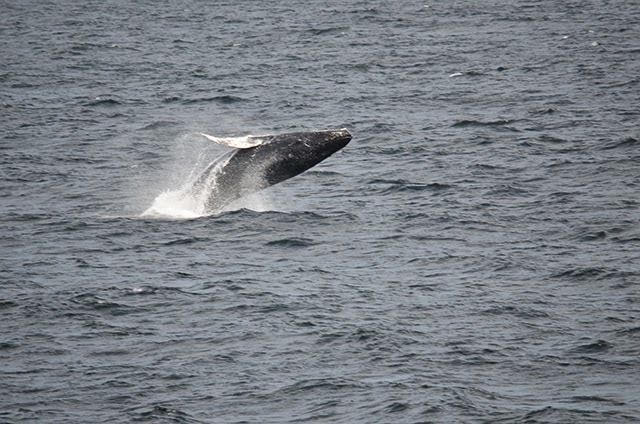 This calf was overall very active today – we were treated to several full breaches! (see photos). An outstanding day on the water! Just a few of the ID’s include Cajun, Pepper, Jabiru, Glo-Stick and calf, Aswan and Pleats.